The supersonic ballistic interceptor missile dubbed as Advance Air Defence (AAD) was fight tested from Abdul Kalam Island, a part of Integrated Test Range (ITR) off Odisha coast at about 11.25 am. 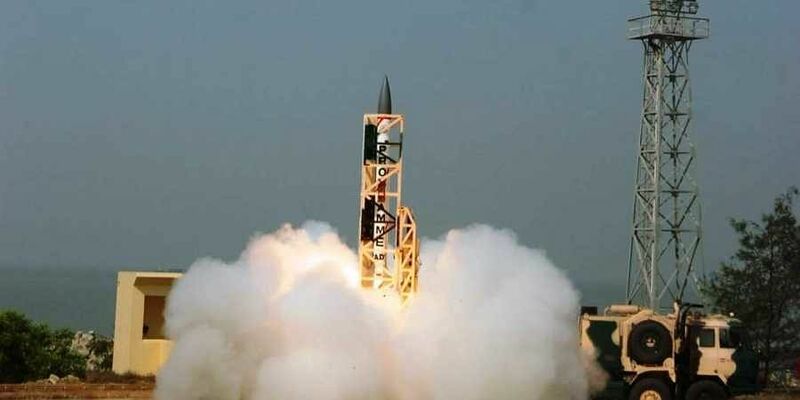 BHUBANESWAR: In a major breakthrough for Defence Research and Development Organisation (DRDO), made in India interceptor missile capable of killing incoming enemy missiles in endo atmospheric region at low altitude shot down a target from multiple simulated targets. For the first time the missile was fired against multiple targets simulated electronically by the mission team comprising officials from the Indian Army. The missile attacked one after choosing it from a bunch of targets. Defence sources said a few minutes after the electronic targets were simulated, the tracking systems selected one from a number of targets and subsequently provided command to launch the interceptor missile, which was auto-fired fired from a hermetically sealed canister. A defence official said the missile has demonstrated its killing capability paving the way for its early induction. “Several tests of the missile conducted earlier were against single target. But this one was against multiple targets for the first time. It was an excellent mission accomplished,” he informed. Long range radar and multi-function fire control radar located far away successfully detected the missile from take-off and tracked it through its entire path. The total trajectory of the incoming missile was continuously estimated by the guidance computer and subsequently the AAD missile was launched at an appropriate time to counter and kill the target missile. The Fibre Optic Gyro (FOG) based INS in interceptor, on-board computers, guidance systems, actuation systems and the critical Radio Frequency (RF) seekers used for the terminal phase have also performed excellently. Indigenously developed by DRDO, the AAD interceptor is a single-stage missile powered by solid propellants. It is 7.5 metres tall and weighs around 1.2 tonnes. It had a diameter of less than 0.5 metre. The DRDO has developed both high-altitude and low-altitude anti-ballistic missiles. The test assumed significance as India plans to deploy a two-tiered Ballistic Missile Defence (BMD) system to protect its important cities and vital installations from enemy attack. While the first phase seeks to destroy incoming enemy missiles in exo-atmospheric region (outside the atmosphere), the second phase envisages killing enemy missiles of more than 2,000 km range in endo-atmospheric (inside the atmosphere) region.